Indeed, worlds have collided! Viking ships, desert outposts, and ancient statues have appeared across the Island, and what better way is there to roam around and explore it all than in a brand new All Terrain Kart (ATK) ready to take you and your squad on an adventure. It started off with a bang, or to be more precise with a ‘’Blast Off’’, an announcement of an Easter egg event in Season 4 that was to happen only once. A rocket launch pierced the sky and opened a dimensional rift leaving tons of clues and hints prior to the release. Worth noting is that by playing and grinding your way to Tier 100, you get additional 1300 V-Bucks, plus 200 V-Bucks from the normal experience gain, so do have that in mind before going on a spending spree, as the basic Battle Pass sure looks like a great bargain. Additional outfits such as "Redline"
The season ends in 73 days on the 25th of September and If you want to get all the benefits faster you always have the option of purchasing more V-Bucks, but a good old school grind, solo or squad, will bring you up to pace making it a proper online, gaming experience. Moving forward, here are some of the other highlights that the Season 5 update has brought about. This is the first introduction of a motorized vehicle in Fortnite and it sure does deliver! The new go-to vehicle is capable of carrying 4 players, has a rooftop which is a portable bounce pad, and receives a boost of speed when you drift it, making it a viable, strategic tool. When maneuvering around the map with the ATK, teamwork is the most crucial part. Other than the driver, the remainder of the squad is able to shoot and build while the rear passengers have the option of leaning back at the same time by holding the ‘’S’’ button or holding back the thumb-stick for controllers, in order to jump higher over obstacles. Head on head encounters with another squad are full of adrenaline and result in chaotic yet electrifying fights. Several drastic changes have occurred on the map starting with Moisty Mire and the surrounding area, being replaced by a desert biome. The new town of Paradise Palms is a cleverly designed place, reminiscent of the southwest of the United States, hence it's desert theme. Interesting enough, this is the perfect spot to utilize the previously mentioned All Terrain Karts on the golf-kart track situated on the outskirts of town. Looting barns, stables, and haystacks in the north is a thing of the past, as Anarchy Acres has been replaced with a flashier, more luxurious resort called Lazy Links. Remember the Viking ships we mentioned? There's a Viking village located on the top of a mountain southeast of Snobby Shores. The meteorite den of Dusty Divot has been replenished by a massive forest outpost. 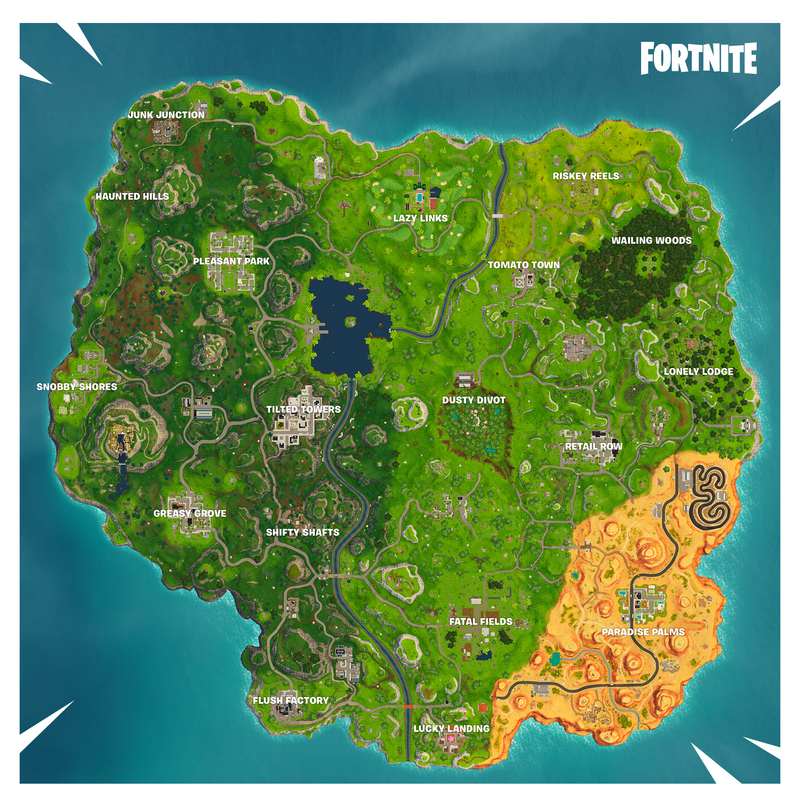 There are additional, unnamed POI's which you can explore throughout the map, but either way, with the introduction of the ATK and the Rifts(see next chapter), a lot more places have become a viable landing spot for you to loot and secure. Well, it looks like the same rifts from Season 4 that "swallowed" the Durr burger sign, are now an integrated mechanic and serve a different purpose. As of know, it seems that these dimensional rifts are randomly scattered all over the map and function as a re-deployment tool. Once you enter one, you reappear above in the air, making you able to use the glider again. This also gives you the option of re-positioning, whether you are in a tight race with the storm or getting the upper hand in an ongoing crossfire. Eight days into the patch and we've only scratched the surface with these several new features as Epic Games continue to expand and deliver with new content, making it a challenge full of undisputed fun. Stayed tuned for more in the days to come.